Gillette is showing its support for the global Movember campaign, which encourages men to grow mustaches to increase awareness for prostate cancer. Launched in 2003, the Australian-based Movember campaign has been gaining momentum in the U.S. in recent years as more and more men have caught on to the facial-hair trend. While other American razor brands have been involved with the marketing campaign for years in various parts of the world, this is the first time that Gillette is participating in the U.S. While a movement that urges men to stop shaving may seem to conflict with the goals of a razor brand, Gillette views Movember as an ideal fit for two reasons. First of all, Gillette understands the importance of supporting men’s health. Secondly, the marketing campaign coincides with the launch of their new Fusion ProGlide Styler for trimming facial hair. Gillette created its new facial-hair trimmer in response to the popularity of facial hair among men today. Over the last ten years, the number of men opting for facial hair has increased five-fold in the U.S. to 16 percent of the male population. Many men also choose to sport facial hair at different times of the year. While they may denounce the clean-shaven look, most men still like for their mustaches and goatees to look neatly groomed, which has given rise to a new market segment of facial hair trimmers. The Fusion ProGlide Styler allows Gillette to compete in this growing segment. Gillette is one of many razor makers involved in Movember. Wahl Clipper Co. has supported the campaign in Canada and the U.K. since 2008, and stateside since 2009. This year, the company is placing 15-second TV spots in Times Square and ads on us.movember.com. Procter & Gamble (P&G) is participating in numerous ways. P&G’s largest effort is the launch of a three-city eMo’gency Styler Tour that promotes Andre “3000” Benjamin, a “Masters of Style” from their Styler campaign. The company is also having their “Mr. 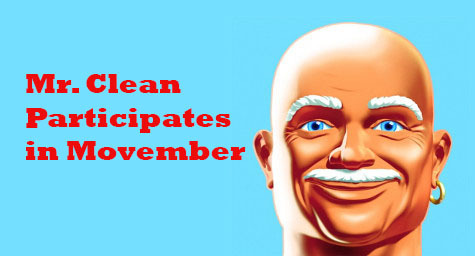 Clean” mascot grow a virtual mustache and erecting a billboard in Times Square in December. As of early November, 175,000 U.S. men have already signed up to grow a mustache, which is ahead of last year’s 145,000, according to Jason Hincks, Movember’s chief operating officer. By supporting the creative marketing campaign, Gillette is positioning the brand as one that cares about men staying both well and well-groomed. To learn more about the latest trends in creative marketing, contact MDG Advertising. At MDG Advertising, a creative Florida marketing firm with offices in Boca Raton and New York, NY, our 360° integrated marketing approach uses just the right mix of traditional and online media to reach your marketing goals. While some industries may fare better in print and others online, we strive to create a balanced approach where digital and traditional advertising efforts support each other and your marketing message is tailored to the medium. To stay on top of the latest trends in creative marketing, contact MDG Advertising.